Racking up airline points by flying or using travel rewards credit cards is fairly easy, but redeeming them for award flights can be more challenging. It can be hard to find available award seats using the airline's search functions, and it takes time to pore over multiple partner airlines' websites and consider different routing options. Thankfully, there are services that can help you get the most value out of your reward points and miles. 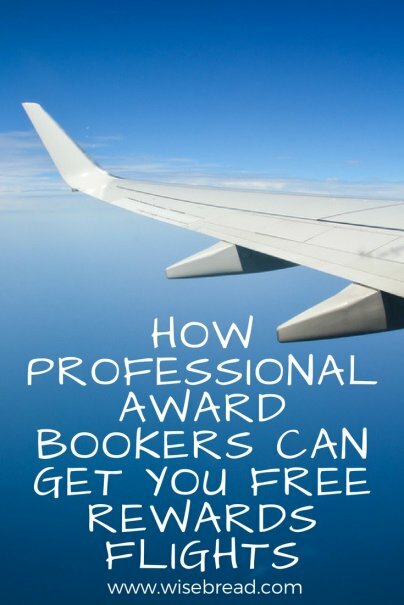 For a fee, you can hire a professional award booker to find and book your award, saving you not only time, but sometimes points worth hundreds of dollars. When you have reward points or miles with a single airline, at first it might seem like a straightforward process to redeem those miles for an award flight. When in fact, it can be difficult, confusing, and time consuming. First, you might try to use the airline's website. However, these websites may not show most of the airline's partner award flights. But even if the airline claims to show all partner awards, its website might not actually display what you are looking for. For example, some airlines will only show itineraries with a certain number of connections. If your itinerary requires you to make more connections than the website will display, then you will be unable to book your award online. And if you do call the airline to get help with award booking, you will often reach indifferent customer service agents who may have little training and even less incentive to spend time on the phone helping you redeem your points and miles. This task becomes exponentially more complex when you're trying to redeem reward points in a flexible program that allows transfers to multiple airline partners. For example, one credit card rewards program lets you transfer your points to miles with nine different airline programs, while another has 16 different transfer partners. The Starwood Preferred Guest program has over 30 airline transfer partners. When you consider that each one of these frequent flyer programs can have over a dozen redemption partners, the award travel possibilities are overwhelming. Finally, booking an award flight can be extremely time consuming. I've been seriously collecting points and miles for more than 10 years, and have redeemed my miles for dozens of award flights for myself, my family, and my friends. I've also researched and written hundreds of articles on credit card rewards and award travel. And yet when I have to book an award, I can spend hours searching various websites, piecing flights together, and calling the airlines to book them. If it takes someone like me that long to book an award flight, imagine what it's like for the average traveler. I have several friends who offer award booking services, and they have two advantages that I lack. They have access to numerous programs and websites that help to automate airline award searching. Sometimes these programs grant special access to the airline reservation systems and can return far more accurate and comprehensive results than the airlines' consumer facing websites do. Other services simply query multiple airline websites and aggregate the results in a more helpful format. Some of these services are available to the general public, but for a fee, that's rarely worth it for most occasional award travelers. In addition, professional award bookers have invaluable experience that they can draw on. These are hard-core travel geeks who have memorized airline award charts and flight routes, and instinctively know how to redeem the fewest points for the best flights. Many award bookers even know how to instruct airline customer service representatives to use their systems to book awards that the agents weren't trained to do. To get started with an award booking company, you will typically have to fill out a form or have a telephone consultation in which you list the points and miles you have, where you are trying to go, and the dates you are willing to travel. Award booking companies are great, but they are not miracle workers. Therefore, you'll have the best results when you can specify a range of possible dates, and you'll do even better if you offer alternate departure airports or destinations. To have the award booking service ticket your itinerary, you will also have to give them your frequent flyer numbers and login information. Once you submit your information, you can expect the process to take at least a day or two before you are presented with proposed itineraries for your approval. Most award booking companies charge clients only when they are able to find an acceptable itinerary. The prices vary but you can usually expect to pay between $100 and $200 per person. For example, Gary Leff runs Book Your Award and charges $185 per person. He got started in the business in 2009 after getting many reader questions about award booking on his travel blog, View From The Wing. His service has since been written about in Condé Nast Traveler, The Wall Street Journal, The New York Times, USA Today, and many other publications. Leff specializes in helping people secure premium cabin international award seats, which are often the most valuable use of your points and miles. "Digging into the minutiae of airline partners and frequent flyer program rules isn't for everyone," Leff says. "And you can't always just enter where you're starting from and where you're going and get all of the options for your trip from your frequent flyer program's website." Ari Charlestein runs Award Magic, which charges $179 per person for one-way and round-trip awards, and $279 per person for multi-destination and round-the-world awards. When Charlestein was in college, he met someone who flew to Australia each year in business class with miles. He recalls thinking, You're telling me these miles that my parents wasted to go skiing in Colorado, we could have used to fly to Australia in business class? When he told his friends and family that he could help them book award flights, and they told their friends, he started doing this on the side, and later went full-time. Typically, his clients reach out to him through his website and schedule a phone call. He then goes through every possible routing and airline, looking for the best combination. For example, he could help you use credit card points to transfer to Virgin Atlantic to redeem for a flight operated by Japan's ANA airline. Should you use an award booking company? But once you've tried and failed to find award space at the lowest mileage levels, and you are feeling overwhelmed, then it might be the time to seek professional help. This is especially true if you're looking for an international flight in a premium cabin, or if you'd like to make multiple stops on your trip. By paying an award booking service a few hundred dollars, you can save the time and aggravation necessary to book an award trip that might be worth thousands.